Genomic information plus clinical information in a large database allows us to identify genes associated with disease variants and truly begin precision medicine. In pharmacoepidemiology this will mean that we can identify patients who benefit most or are at greatest risk of an adverse event from a specific treatment. The power of linking genomic information with clinical information is demonstrated in a recent study by Karnes et al 2017. They examined variations in major histocompatibility complex (MHC) and human leukocyte antigen (HLA) genes by linking information from DNA biobanks databases with EHR records for almost 30,000 people. Most importantly, they discovered previously unidentified associations between gene variation and disease severity for several conditions. They identified associations with type 1 diabetes and ankylosing spondylitis, among other conditions. 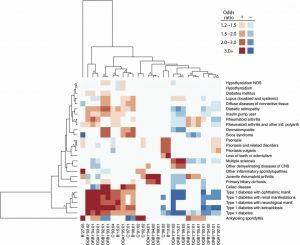 Most importantly, they discovered several previously unidentified associations with MS and cervical cancer, as well as associations between gene variation and disease severity for several conditions. The heatmap crosstabulates HLA alleles with a range of disease diagnoses with darker reds being stronger positive associations (the allele increases the probability of having the disease or phenotype) and darker blues being stronger negative associations (the allele is associated with a protective effect against the disease or phenotype). The authors note that this is one of the first systematic studies of clinical phenotypes with HLA variation in a single population. Heatmap of four-digit HLA allelic associations with P < 1 × 10?5. The recently published text, Drug Utilization Research: Methods and Applications, represents a formidable accomplishment, pulling together a comprehensive range of information on all topics related to this key area. With 48 chapters, it addresses study design, data collection, secondary data sources, classification systems, measurement units, drug expenditures, statistical methods, data visualization, and much more. I was happy to see a chapter addressing issues around pediatric drug utilization, and chapters on drug utilization of pregnant women and older populations, as well. Drug Utilization Research (DUR) is an eclectic scientific discipline, integrating descriptive and analytical methods for the quantification, understanding and evaluation of the processes of prescribing, dispensing and consumption of medicines and for the testing of interventions to enhance the quality of these processes. The discipline is closely related and linked mainly to the broader field of pharmacoepidemiology, but also to health outcomes research, pharmacovigilance and health economics. Drug Utilization Research is a unique, practical guide to the assessment and evaluation of prescribing practices and to interventions to improve the use of medicines in populations. Edited by an international expert team from the International Society for Pharmacoepidemiology (ISPE), DUR is the only title to cover both the methodology and applications of drug utilization research and covers areas such as health policy, specific populations, therapeutics and adherence. The only way to assemble such a book is with a strong group of editors, Monique Elseviers, Björn Wettermark, Anna Birna Almarsdóttir, Morten Andersen, Ria Benko, Marion Bennie, Irene Eriksson, Brian Godman, Janet Krska, Elisabetta Poluzzi, Katja Taxis, Vera Vlahovi?-Pal?evski, Robert Vander Stichele are all accomplished researchers in this field. An unnecessary, completely avoidable outbreak of Measles in the United States. Measles vaccination protects against measles. The measles vaccine, and so many other vaccines, are some of the biggest successes in public health, leading to almost 100% decreases in the incidence of a wide range of fatal and disabling infectious disease. Some children have medical conditions that preclude vaccination (see CDC “Who Should Not Be Vaccinated”), but this is a small group. 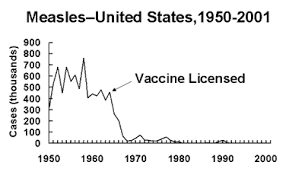 Some parents of healthy children believe (without any basis) that measles vaccines (and others) cause a range of negative health effects in children and, the current generation of parents born in the 1970’s, 80’s and 90’s, don’t remember how deadly infectious diseases can be. A third group of parents have religious beliefs opposed to vaccination. Most states require vaccinations before entry to the kingergarden, but may allow unvaccinated children to attend pre-school. Some states provide exemptions for religious or other objections (see the CDC database for state immunization laws). Because vaccinations have been so successful in eradication of infectious diseases, people have forgotten how terrifying and harmful the diseases were, and have focused their anxieties on the vaccines instead of the disease. 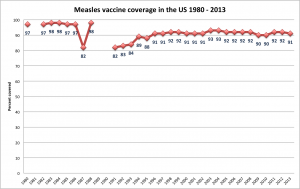 This figure shows a downward trend in measles vaccine coverage in the United States, between 1980 and 2013, and the decline from initial high levels of 97 and 98% down to current levels of 91% is enough to affect herd immunity and allow the current outbreak of measles. a vigorous discussion and flood of information reminding us all about the value of vaccines and the importance of vaccination, including a wide range of articles, stories and commentaries giving voice to the message. Articles and cartoons in The New Yorker (not sure it is helpful to call people “idiots”), but an indication of the widespread involvement in the discussion. Roald Dahl’s account of his 7 year old daughter’s death from measles.